Micro Slitting Machine is a solid and strong machine that is specially constructed to provide a vibration free, smooth operation. It consists of a solid cast iron side frames to help the construction. Moreover, the parts are also precision ground. The Micro Slitting Machine has some specific features like its roll width is around 300 mm. Moreover, it work at speed of 150 m/minute. The Micro Slitting Machine provides the advantage of providing grease points at the right places. It actually help the buyers in executing the maintenance work and the machine stays on perfect condition to give 100% output. 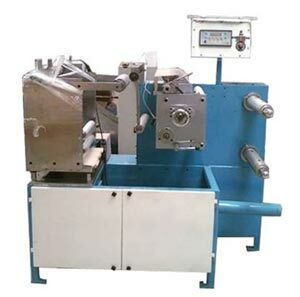 The Micro Slitting Machine is very advantageous as both the controls of the brake and the lateral movements have the extension till the front of the machine which is also the operator’s main position. Thus it helps the operator to operate the machine much more easily. Precision Micro Slitting Machine (Minim. 6mm) – specially designed for Narrow Web Line.